Row 1 Item 3 & Row 2 Items 5 & 6 Look suitably shaped. 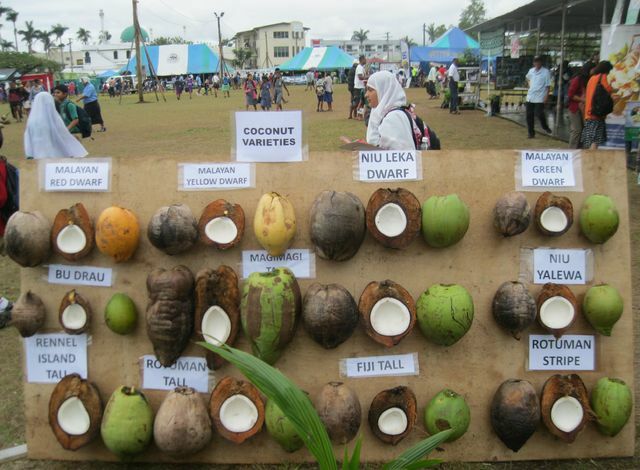 My money's on middle row number 5 as a match for your coconut cup. 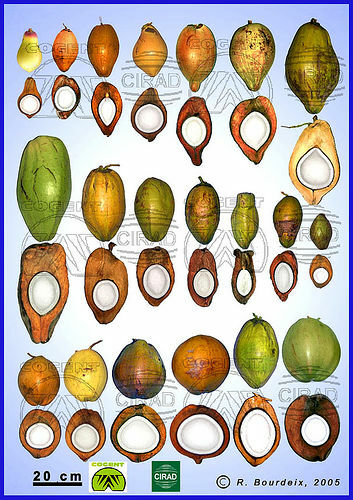 Just to clarify for our readers the coconut tree (Cocos nucifera) is a member of the family Arecaceae (palm family) and its fruit is a big green-skinned nut yielding coconut-water and coconut flesh and a hard protective shell which has been used for centuries to make decorative cups, bowls and ornaments. Cocoa is a product of an entirely different tree. There is no cocoa nut but a pod bearing cocoa beans from the Theobroma cacao a.k.a. cacao tree and cocoa tree, which is a small (4–8 m (13–26 ft) tall) evergreen tree in the family Malvaceae, native to the deep tropical regions of Central and South America. Its seeds, cocoa beans, are used to make cocoa mass, cocoa powder, and chocolate. Many thanks. Gives me some idea. I particularly like (for no very positive reason) the tall Tuvalu. The shape's right, if not the size. Using the 20cm scale in the upper picture = 8", and ignoring the skin and pith around the woody shell of the Tuvalu Tall fuafatu coconut (No. 5 in the middle row), the shell would be 5" tall and 3" at its widest point. Allowing that an inch must be cut off the top to the rim of the vessel, would that not be about the same size as yours? Some cool stuff amongst these items.